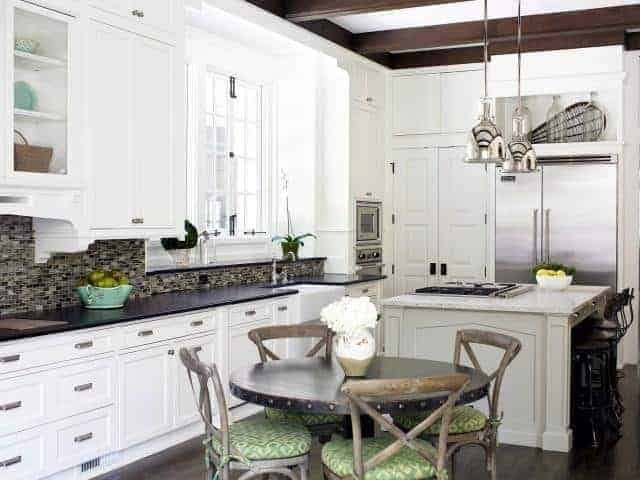 The best white paint color for kitchen cabinets. 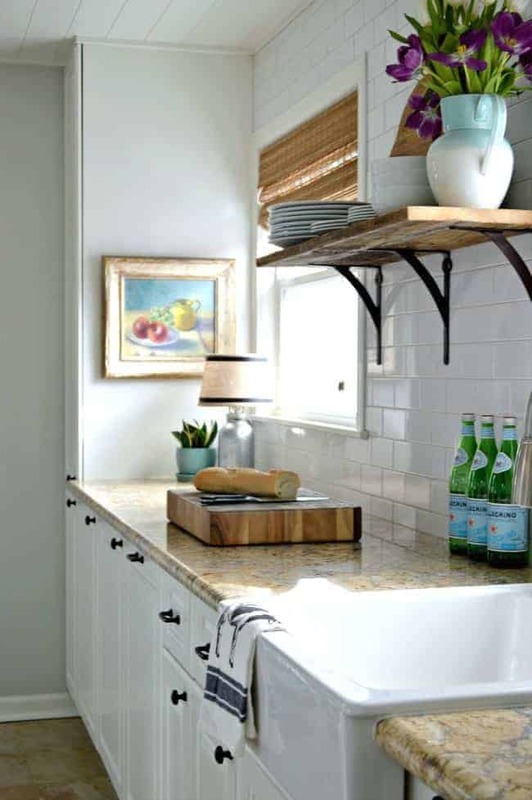 Everywhere you look online, white kitchen cabinets are all the rage. Actually white kitchens have been around forever, we just have more opportunity to look into people’s homes thanks to the internet and Pinterest. 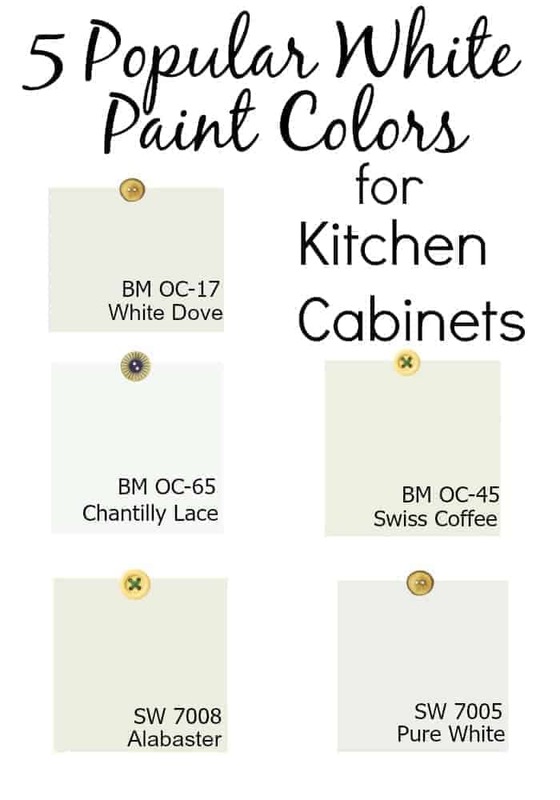 Anyway, I am in the middle of painting my cabinets white and I thought I’d share some great (and popular) white paint colors for kitchen cabinets. 1. BM White Dove – a soft warm white with a touch of gray. 2. BM Chantilly Lace – a true white that is not too gray or creamy. 3. BM Swiss Coffee – a creamy white. 4. SW Alabaster – a warm but crisp white. It’s often compared with BM White Dove. These are just a few of the whites I considered when I was trying to choose a color for my own kitchen cabinets. It took me several tries to pick “the one” for my cabinets but I finally found the perfect color. If I could give you one good tip on choosing paint for your cabinets it is to try it in your room (not just with the paint chip). I bought a few pieces of poster board and painted them with the samples I picked out. Use painter’s tape to put your sample on your cabinet and keep it there for several days, look at it in daylight and at night. 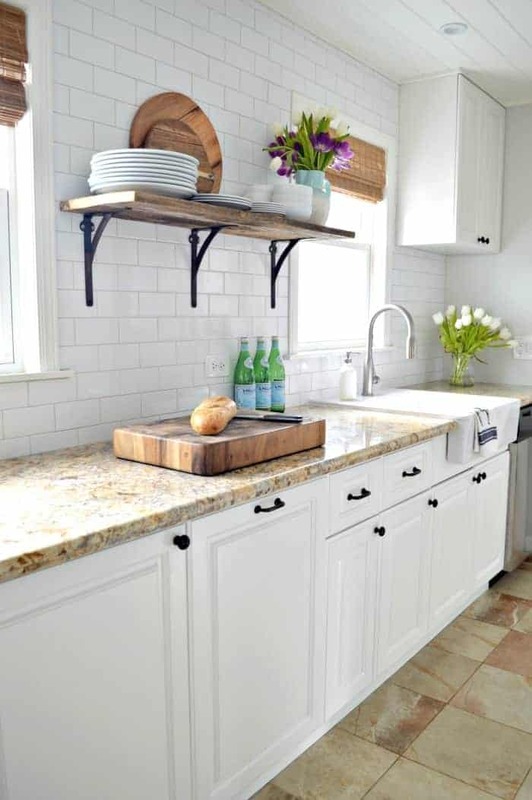 Try it all around your room, even near your appliances and backsplash material, and you’ll find your white. Picking a paint color for your kitchen cabinets doesn’t have to be stressful. Which one of these white paint colors did I go with? We went with Benjamin Moore White Dove, and it was the perfect choice. I also used it on the trim, doors and 4 of the ceilings throughout our house. It’s safe to say that it’s one of my favorite white paint colors. Check out my completed kitchen remodel, along with my white painted cabinets. Are there any white paint colors that you’d love to use in your home? Hello!I just subscribed to your newsletter. I love all your projects especially your white kitchen cabinets. We are about to begin a home remodel. My cabinets are beautiful dark oak but I want to lighten things up . A few years ago we had the plate rail removed & crown molding added. We had santa cecelia granite installed,travertine back splashes , new can lights & quality laminate wood flooring. Planning to take out all carpet & install hardwoods & wider baseboard. Also crown molding in main living spaces. I’m planning to do the painting myself on doors,trim & window casings. Will try to find a professional for kitchen cabinets. I picked up several paint samples today;SW alabaster,BM swiss coffee ,BM white down & BM white dove. I really don’t want a stark white kitchen. What’s your opinion on kitchen cabinets in swiss coffee & doors,trim & baseboards in alabaster? Also your advice on prepping the wood stained trim & window sills & trim. We’ll be installing new doors. So sorry for the delay with my response, I was out of town for a few days. It sounds like you have quite a big project going. All the paint colors that you picked out are great choices for brightening up a kitchen. I also didn’t want stark white and that is why I went with BM White Dove. I think that BM Swiss Coffee would be a great paint color for your kitchen cabinets. My advice would be to paint a poster board with the paint colors that you really like and put them around the room. If you like the SW Alabaster, put that with the Swiss Coffee and see how you like it. Our walls were all painted with SW Alabaster and it was too yellow in our living room and hallway (which have little natural light). It really depends on the lighting in your own home. As for prepping the trim and window sills, it should be fairly simple. If there is a shine to the finish, you need to sand it down with a 150 grit sandpaper. Sand it smooth and then wipe off the dust with a damp rag. If there isn’t a shine, I would just rough up the wood a bit with the sandpaper. After the wood is sanded and clean of dust, I would prime it before painting. You may need to sand in between coats if the paint raises the grain. I am getting my cabinets painted in Swiss Coffee. I am wondering whether I should paint the walls, trim, and ceilings all in Swiss Coffee. I dont have alot of wall space anyway. Right now my walls are Pale Almond and my trim and ceilings are simply white which is pretty much through my whole house. Did you paint everything in White Dove? I’m debating between SW Albaster and Pure white for my kitchen Reno. I want carrera-type quartz countertops. Which do you think would work better? Hi Carol. Suggesting paint colors is a bit tricky. Theres’s so many factors to take into account, mostly light in your room. SW Alabaster was used in my home, by the previous owner, and it looks very yellow (there’s not much natural light in the room). I would take a chip of each color and a sample of the countertop you want to use and put it in the room. I think that will tell you what color you should use. I hope this helps. Let me know if you have any other questions (and I’d love to hear which color you go with). Something that will look good with dark floors and cool color granite countertop. It’s hard to give recommendations on a room that I haven’t seen. You have to consider the lighting in the room and the colors of your floors and countertops. I would suggest you take a few colors that you like and paint a piece of poster board. Put the samples around your kitchen and look at them in different light. Best of luck and I’m sure that, whatever you choose, your kitchen will look beautiful. I desperately love the square stainless steel barstools you have featured. Where can I find them !??! Hi Leanne. I’m so sorry but I have no idea where you can find the barstools. Have you clicked on the link at the bottom of the photo? I believe that it is from the Home Bunch website. Sorry I couldn’t be more help. Looks great! Did you do your trim in kitchen Alabaster as well? painting our cabinets alabaster and trying to decide on a white for trim but i think i will just do alabaster too so they dont clash. Thanks, Amy. Actually, the cabinets were painted with White Dove, the same color as all of the trim. Hope that helps. I’m looking at buying a fixer upper that’s going to require a MAJOR paint overhaul. I’m leaning toward just picking a white and using it ceiling to floor including cabinets. Simplicity is the key at the moment. My question is, is there a finish that’s acceptable for ceiling, trim, and walls? I imagine cabinets all need to be semi-gloss but I really just need the easiest option to get the job done. I’m open to any insight you have. I have hired a cabinet painter and he starts on the 27th. I have looked at every white color and have had large swatches up on my cabinets for months now. Everyone recommends White Dove but it looks so dingy and dirty in my kitchen. Even my daughters and husband don’t like it. We are leaning towards Chantilly Lace as it seems to look beautiful at all times of day/night. I hope it isn’t too stark but I just can’t take the dirty look of White Dove in my kitchen. 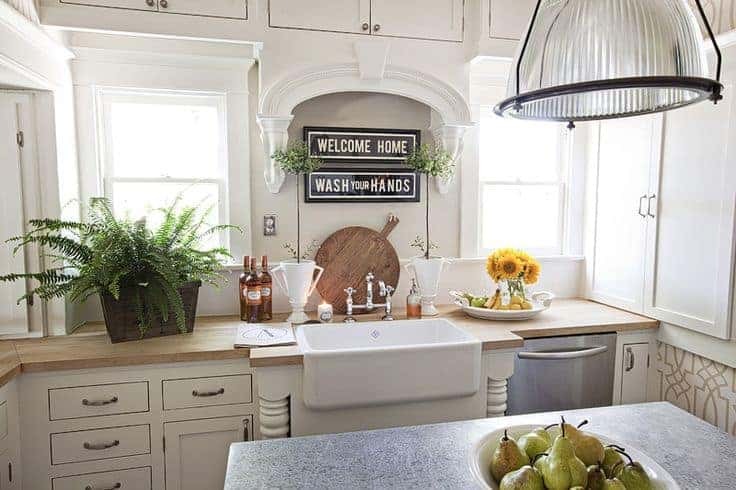 I have read as many articles as I can as to why White Dove looks so dirty and it seems that if one has a very bright kitchen with lots of light, it will look dirty. Darker rooms look good with White Dove it seems. 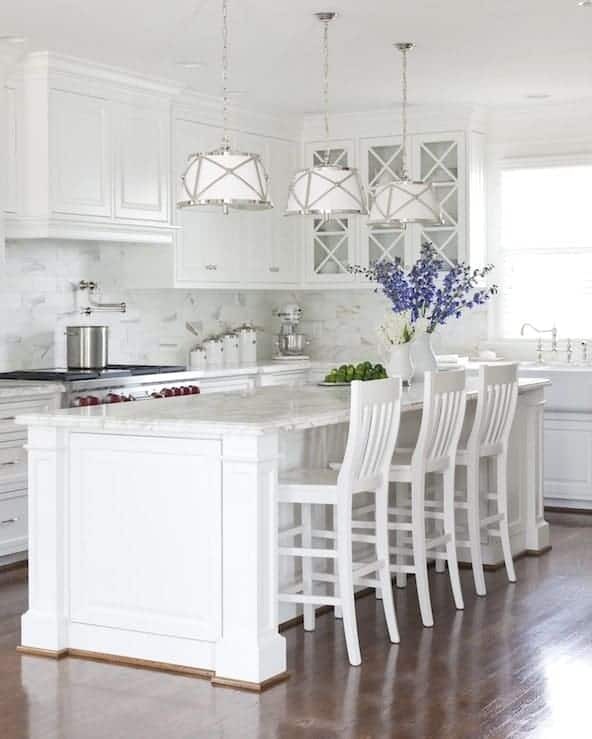 Thanks for sharing your thoughts on white paint for your kitchen cabinets Sue. I’m glad that you were able to find a white that looks good in your kitchen. White Dove is very popular but not everyone likes it or can use it. Good luck with your cabinet painting. I just had my kitchen cabinets painted in white dove, but the painter had SW match it. Long story made short, they have a yellowish-green cast. I’m hoping one coat will do the trick. Is there a SW color that matches Behrs english coffee? I love that color. Thanks! Hi Julie. Did you try your local Sherwin Williams store? Maybe take a swatch of the color you like and they can match it. They can usually match another brands color pretty closely. Good luck! I never knew there were so many different white choices for cabinets. That’s a good idea to put the paint on a poster board, rather than your cabinets. Thanks for the tip. I’m here from the Thursday Favorite Things Blog Hop. There are so many whites out there that it’s overwhelming. I’m just glad that I found something that worked well in my house. So glad you liked my tip on painting poster board for sampling colors. It’s really helpful and you can just move it around your room without having different colored paint stripes all over your walls. Hello, I just painted my kitchen cabinets with Alabaster from Sherwin Williams. I am really happy with it. It is like White Dove. I had a 40% off coupon for SW, so I matched the White Dove chip I had planned to use. I thought the paint was good too. I did a lot of research, you picked all colors that were on my short list. I heard that SW Alabaster was a close match to BM White Dove. Isn’t it an awesome color? I am going to paint my basement stairway and try SW Alabaster so I’m excited to see how they measure up to each other. Hopefully I can find a coupon like you did. 40% off is great! Thanks! Those whites are beautiful! Will you be showing pictures of your cabinets when they are painted? Yes Stacey, I’ll definitely show pictures of my painted cabinets. I’m working hard to get them finished. I hope you’ll come back to check our progress. Thanks for stopping in. I love SW Dover White in my kitchen and recently fell in love with Valspar Bermuda Sand. I pick up old cabinet doors from Habitat and use them as sample boards. You are so right about seeing your paint choices in the area you will be using it. Great idea using old cabinet doors from Habitat. Love that place. Thanks so much for sharing your fav paint colors too. I need to check out that Valspar Bermuda Sand. 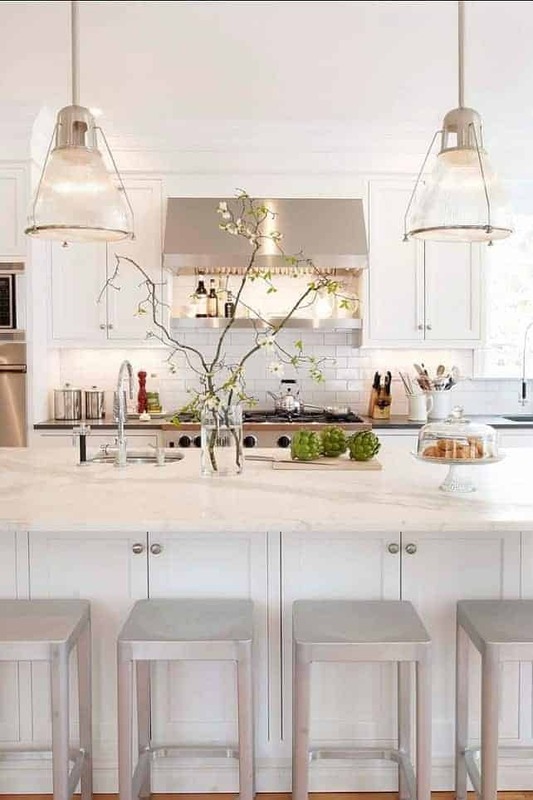 Wow, those kitchens are truly stunning and I adore all the whites. I think I would have a really hard time choosing a color. I bet your cabinets are beautiful, can’t wait to check them out! Thanks Kim. Picking a paint color is never easy for me and whites are especially hard. Glad I found something that works in our house. Thanks again for sharing your kitchen reno regrets. Kristi, the only room that is white is my living/dining room and I don’t remember what name was it’s been so long. I’ve been thinking the room(s) could use a sprucing up. If I can’t remember the name it definitely DOES needs a new paint job! I’m fond of Behr paints so it will probably be repainted one of their whites, although I did like the BM Swiss Coffee in your post. Behr paints has swiss coffee. I have all my trim painted in it. That’s a great color too Maria! Thanks for sharing your paint choice. I never knew there were so many different shades of white! I mean, I kinda figured, since there’s multiple shades of “greige” but it’s still crazy at the variety of these somewhat basic colors! Kitchen White in my kitchen. I like the crisp look of pure white with beach colors. If I every get the energy to strip the wall paper that came in my home I will paint the walls a soft yellow. The cabinets are a grey white but I will probably leave them since I can’t afford a painter and I refuse to paint cabinets again. LOL Been very slow progress on getting my condo done, I am not as young as I used to be. Thanks for stopping by today Deborah. All the white in my home is Snowfall White (BM) which is actually on a card of green shades. I don’t see any green but I liked it with our white vinyl windows, carpet and favorite fabrics way back when we built the house in 1988, It still works well. It’s great when you find a color that your happy with, isn’t it Barbara? Glad that it works so well for you. All my trim in my house is Chantilly Lace. It has a squirt of black in it and is a cold stark white. So if you want something warmer don’t use Chantilly Lace. If you want a stark white do. 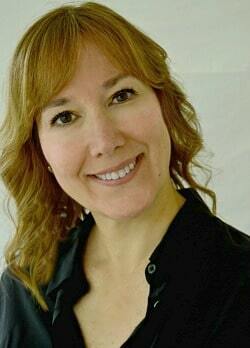 I really would love to change all my trim to something softer, but it would be so much work. If I can ever afford to hire someone to repaint all my trim I will. I have painted almost all of the trim in my house and it is a huge job. I hope I don’t ever have to do it again. 😉 Thanks so much for sharing info on Chantilly Lace.